The current owner, Dean Schienbein, began working at Potomac Sailmakers at the turn of the century, under the steady hand of one of the company founders, Jack Wong, an aeronautical engineer who was fanatical about sailing and sails. Jack passed away in 2007 at the age of 76 and Dean took the helm of Potomac Sailmakers three years later. Dean’s passion for the marine industry dates back to high school, when he washed boats for a marine retailer in Alexandria. That was 1978. 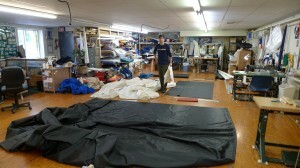 It was working in the local marine industry that Dean got to know Jack Wong and Potomac Sailmakers. The company was always known as a reliable source for canvas and sail work, every since it was founded by Jack in 1972. Jack’s background as an aeronautical engineer and his many years racing sailboats were a big reason for the company’s success. His devotion to customers was well known. Dean carries these values forward today.